Thermage is an extremely popular non-surgical treatment that many celebrities, including Oprah Winfrey & Gwyneth Paltrow, swear by. In order to decide if the Thermage machine was as good as we were told, Dr. Martin was the first one to undergo treatment at our clinic- watch the video below to hear what Dr. Martin had to say about it. It works by heating up the collagen in the lower layers of the dermis using radio frequency energy. 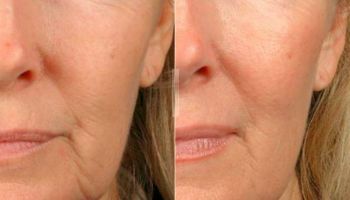 Deep heating causes the skin to tighten and new collagen to form. 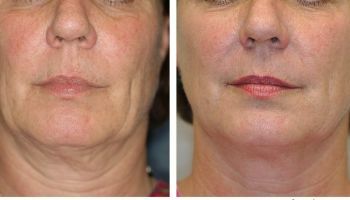 After 6 months, your skin will appear tighter and more firm. It's best used for non-surgical brow and jowl lift, facial wrinkles and sagging skin. While some improvement is immediately noticeable, the most amazing part is that improvements continue for up to six months. The clock on aging is stopped. Thermage works on all skin types and colours. Everyone will benefit from a treatment. The treatment feels like short bursts of heat. Most people require pain mmedication by prescription which will be provided to you in advance of your treatment. None, most people get back to their normal routine and can resume normal activities immediately. We encourage you to drink plenty of water in the days leading up to the treatment in order to maximize the tightening effect. After your Thermage procedure, you do not have to avoid the sun as with laser treatments. Of course, sun protection is always advisable for overall good health. Can I Receive Treatment If I'm Pregnant or Breastfeeding? No, women who are pregnant or breastfeeding are not candidates for treatment.